International whaling bans have been in effect since the early 1980s, but many populations have been slow to recover. Using the current International Whaling Commission database and other sources, a new study helps explain why. Basically, we killed a lot more whales than we realized. In sum, we estimate that nearly 2.9 million large whales were killed and processed during the period 1900–99. Of this total, 276,442 were killed in the North Atlantic, 563,696 in the North Pacific, and 2,053,956 in the Southern Hemisphere. The years 1925–39 in the Southern Hemisphere and 1946–75 in both hemispheres saw the highest totals of whales killed. For the entire 20th century, the largest catches were of fin, Balaenoptera physalus, and sperm whales, Physeter macrocephalus, with 874,068 and 761,523 taken, respectively; these comprised more than half the total of all large whales taken. Previous estimates for whale slaughter in the 20th century were much lower, but apparently, older studies lacked accurate reporting numbers from the Soviet Union, which we now know conducted extensive illegal whaling for nearly 30 years following World War II. 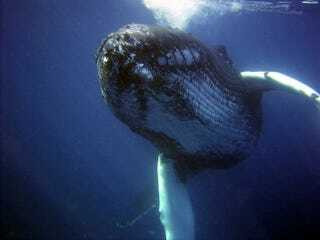 Whales are long-lived animals that reproduce slowly and, because of their large size, have naturally small populations. While humans had been hunting whales sustainably for centuries, the introduction of more advanced technologies in the 20th century, such as exploding harpoons and sonar, accelerated the demise of many populations. Following an international whaling moratorium in 1982, all nations except Japan, Norway and the USSR ceased whaling operations. Still, many populations have not recovered as well as we'd like. In part, this has to do with continued whaling by a handful of nations today (Iceland resumed commercial whaling in 2006, and Japan has a long history of defying the IWC). Whale populations are also under new threats from military sonar, ship traffic and climate change. But the updated whaling stats for the 20th century offer another reason for the slow recovery: We nearly picked the oceans clean. If you'd like a nice breakdown of how many whales are left out there, Vocativ has rolled it all together into a colorful infographic. The open-access article can be read here.